1984, it produced four certified gold singles in Canada. A couple weeks ago I heard something curious during a flashbacks scene of the season opener of “Saving Hope”. There, playing in the background on the kitchen radio, was the old Honeymoon Suite song, “Wave Babies”. Given “Saving Hope” is a Canadian show, set in Canada, and the flashback was to the 1980s, it was a likely song to be playing on the radio. It was the first time I had heard any Honeymoon Suite song on TV in years, and never on a network TV show. It brought back a lot of memories, starting with the album “Wave Babies” came from. 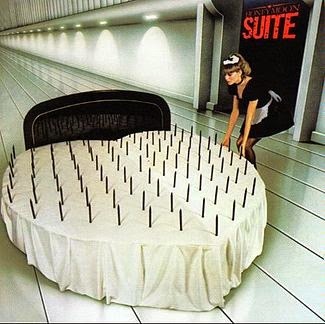 For the longest time I thought my first exposure to Honeymoon Suite was from their second album, but it turns out that it actually was from their debut album entitled, “Honeymoon Suite”. There was a show on after school on CBC called “Coming Attractions” which morphed into “Coming Attractions Video” then “Video Hits”. Originally, it featured all kinds of entertainment news, but evolved into a show that played music videos, hosted by Samantha Taylor. It was some time in Grade 9 when I started watching it more often. That’s when I started hearing about this contest they were running. I did not pay too much attention, other than that the prize was a cameo appearance in Honeymoon Suite’s next video. My friend and neighbour Mat, talked about it periodically too. The next thing I recall was seeing that video, and it featured a sweeping panoramic shot of Niagara Falls and a couple of those binocular machines you can plug coins into to watch the falls. It was part of the honeymoon theme of Niagara Falls. That video was “Wave Babies”, and Mat later told me the aforementioned cameo was a couple seconds of the two winners bopping to the music. The next time I gave that debut album “Honeymoon Suite” any attention was when Mat bought it when he joined Columbia House. It was one of the initial 10 he purchased to join. By then, the end of 1986, I was well acquainted with the band’s sound. I wanted more, so I borrowed Mat’s tape and immediately dubbed a copy of my own. I was not disappointed with what I heard. The first four singles on that album were the ones that all made it to radio. I have a few odd memories. It may have started with "New Girl Now", but it was "Burning in Love" that I always remember. Me and Mat used to cruise down Mayor Magrath Drive in Lethbridge listening to that song, bellowing out the chorus, "I'm still, a lonely man, burning in love". One day, I was hanging out with Mat's younger brother, and he said to me, "You know what my brother was singing this morning?" "White steel, a lonely man…"
Why was he doing that? It turns out that's what he thought Johnny Dee was singing. I laughed so hard, because for one, that makes no sense, and two, I have made up words just as bad for other songs. I can still here, "White steel, a lonely man, burning in love." The other memory was more heart wrenching. A few months ago I documented the horrible first date I had to go see "Secret of My Success". Well, I was too dumb to take a hint. I kept calling that girl, and will write about what transpired at another time. However, when the annual Whoop-Up Days fair and midway hit Lethbridge the summer of 1987, I phoned her to see if she wanted to go to "Midnight Madness". She did not. I went with a buddy of mine and, with "Burning in Love" playing in the background, I saw her getting on a ride. That was the official end of my pursuit of that girl. Unfortunately, I had no new girl now. "New Girl Now", "Wave Babies", and "Stay in the Light" followed. Due, in part to Canadian content requirements, they all got a lot of air play and made Honeymoon Suite a household name in the mid-1980s. Honeymoon Suite is a band I started listening to after they gained some popularity. Usually, we hear the debut album and interest builds from there. Here instead, I got to know Honeymoon Suite and, with no new album forthcoming, went looking for more music. In this case it happened to be older music. Still, I was not disappointed, and it just reinforced my love for a band I still listen to, even if it is 30 years later on a medical drama on CTV.